Previous studies and own clinical observations of patients with systemic lupus erythematosus (SLE) suggest that SLE harbors distinct immunophenotypes. This heterogeneity might result in differences in response to treatment in different subgroups and obstruct clinical trials. Our aim was to understand how SLE subgroups may differ regarding underlying pathophysiology and characteristic biomarkers. In a cross-sectional study, including 378 well-characterized SLE patients and 316 individually matched population controls, we defined subgroups based on the patients’ autoantibody profile at inclusion. We selected a core of an antiphospholipid syndrome-like SLE (aPL+ group; positive in the lupus anticoagulant (LA) test and negative for all three of SSA (Ro52 and Ro60) and SSB antibodies) and a Sjögren’s syndrome-like SLE (SSA/SSB+ group; positive for all three of SSA (Ro52 and Ro60) and SSB antibodies but negative in the LA test). We applied affinity-based proteomics, targeting 281 proteins, together with well-established clinical biomarkers and complementary immunoassays to explore the difference between the two predefined SLE subgroups. The aPL+ group comprised 66 and the SSA/SSB+ group 63 patients. The protein with the highest prediction power (receiver operating characteristic (ROC) area under the curve = 0.89) for separating the aPL+ and SSA/SSB+ SLE subgroups was integrin beta-1 (ITGB1), with higher levels present in the SSA/SSB+ subgroup. Proteins with the lowest p values comparing the two SLE subgroups were ITGB1, SLC13A3, and CERS5. These three proteins, rheumatoid factor, and immunoglobulin G (IgG) were all increased in the SSA/SSB+ subgroup. This subgroup was also characterized by a possible activation of the interferon system as measured by high KRT7, TYK2, and ETV7 in plasma. In the aPL+ subgroup, complement activation was more pronounced together with several biomarkers associated with systemic inflammation (fibrinogen, α-1 antitrypsin, neutrophils, and triglycerides). Our observations indicate underlying pathogenic differences between the SSA/SSB+ and the aPL+ SLE subgroups, suggesting that the SSA/SSB+ subgroup may benefit from IFN-blocking therapies while the aPL+ subgroup is more likely to have an effect from drugs targeting the complement system. Stratifying SLE patients based on an autoantibody profile could be a way forward to understand underlying pathophysiology and to improve selection of patients for clinical trials of targeted treatments. Systemic lupus erythematosus (SLE) is an autoimmune disease with a heterogeneous presentation covering a wide range of phenotypes, from subtle symptoms to life-threatening conditions. The heterogeneous presentation of SLE is a major obstacle in clinical trials as there are no good biomarkers to measure disease activity in general or to compare disease activity in different organ systems. Response to treatment may also differ between subgroups [1, 2]. Due to this heterogeneity, treatments with good effect in SLE subgroups will likely fail to show efficacy in SLE overall. Consequently, poorly delineated and unrecognized SLE subgroups may blur important outcomes of clinical trials and thus prevent subgroups of patients from achieving improved quality of life. The lack of biomarkers also hampers accurate diagnosis, prediction of prognosis and treatment . The diagnostic overlaps between SLE, anti-phospholipid syndrome (APS), and Sjögren’s syndrome (SS) are evident in the clinic. It is in this context important to remember that the present APS criteria advice against separating APS into primary and secondary subsets, since there is no evidence that the clinical consequences of anti-phospholipids (aPL) among patients in these two categories differ . Vascular events, main characteristics of APS, have consistently been associated with aPL in several prospective SLE studies [5–7]. Cluster analyses based on autoantibody profile have been performed to detect subgroups of SLE patients. To et al. reported three major clusters consisting of an aPL, a Sjögren’s syndrome antigen A/B (SSA/SSB, anti-Ro/La), and an anti-Smith/ribonuclear (Sm/RNP) autoantibody cluster in a large American SLE cohort . Similar antibody clusters were identified in a Turkish SLE cohort: an aPL, a SSA/SSB, and a Sm/RNP cluster, but they also identified an anti-double stranded DNA (anti-dsDNA) antibody cluster . The aPL linked clusters were associated with higher damage scores according to the Systemic Lupus International Collaborating Clinics (SLICC) damage index (SDI) , in particular with vascular damage , i.e., the main reason for a shorter life expectancy in SLE . To prevent the occurrence of vascular and permanent damage, it is therefore very important to identify patients belonging to the aPL+ SLE cluster early. Based on own clinical observations and inspired by previous studies [8, 9], we defined two subgroups: a SSA/SSB+ and an aPL+ subgroup. In order to get a straightforward and simply applicable definition of the second subgroup, we decided to use lupus anticoagulant (LA), a strong and well-recognized APS predictor [4, 10]. We combined data from affinity-based proteomics, routine clinical measurements, and biochemical assays to investigate possible differences between the two subgroups. We hypothesized that there are important molecular/pathogenic differences underlying the aPL+ and SSA/SSB+ SLE sub-phenotypes. When this study was initiated, the Karolinska SLE cohort comprised 378 consecutive SLE patients and 316 age- and gender-matched population-based controls. All SLE patients fulfilled at least four of the revised American College of Rheumatology classification criteria for SLE . At inclusion, all participants were subject to a structured clinical examination and an extensive protocol was filled out. Disease activity was determined by both the Systemic Lupus Activity Measure (SLAM) of global lupus activity and by Systemic Lupus Erythematosus Disease Activity Index 2000 (SLEDAI-2K) . Organ damage was scored using the SDI . EDTA plasma was collected from fasting patients and controls and stored at − 70°C. The ethical board at the Karolinska University Hospital approved the study (reference number 03-556). All study participants gave written informed consent to participate. The aPL+ subgroup was defined as SLE patients who were positive in the lupus anticoagulant (LA) test and negative for all three SSA (Ro52 and Ro60) and SSB antibodies. The SSA/SSB+ subgroup was defined as patients who were positive for all three of SSA (Ro52 and Ro60) and SSB antibodies but negative in the LA test. Positivity/negativity was based on analyses of samples taken at inclusion. The immunological profile was determined in all patients by established and standardized techniques at the laboratories of clinical immunology and clinical chemistry at Karolinska University Hospital, as previously described : e.g., antibodies to specific nuclear antigens (dsDNA, SSA-Ro52, SSA-Ro60, SSB, Sm) and phospholipids (cardiolipin immunoglobulin (Ig) G/IgM and β2-glycoprotein1 IgG/IgM) were analyzed by multiplexed bead technology (Luminex) using BioPlex 2200 system (Bio-Rad, Hercules, CA, USA) according to the specifications of the manufacturer. Lupus anticoagulant (LA) was determined using a modified Dilute Russel Viper Venom method (Biopool, Umeå, Sweden) and Bioclot lupus anticoagulant. Complement factors C1q, C4, C3, and C3dg were all measured at Karolinska University Hospital. Complement factors C3a and the fluid-phase terminal complement complex, consisting of the components C5b, C6, C7, C8, and C9 and the S-protein were measured by sandwich ELISA as described earlier [13, 14], in addition C2 concentrations were measured by electroimmunoassay . Rheumatoid factor (RF) IgM/IgA/IgG was analyzed by enzyme immune assay using Phadia 2500 (Elia, Phadia Thermo Fisher Scientific, Uppsala, Sweden). The detection range was 0.4–≥ 214 IU/ml for RF-IgM, 0.4–200 IU/ml for RF-IgA, and 0–600 μg/ml for RF-IgG. Selection of proteins (Fig. 1) was based on previous published results identifying candidate biomarkers in SLE, myositis and general inflammation. A list of proteins shown to be upregulated in SLE compared to controls based on microarray data  were included in the list of protein targets. In addition, our own global, untargeted MS-based proteomics analysis (Additional file 1) provided additional biomarker candidates. The study was subsequently performed against those proteins to which high-quality antibodies were available within the Human Protein Atlas (HPA) project . The HPA contains the majority of all human protein-coding genes and polyclonal antibodies have been produced targeting protein fragments of the corresponding proteins. These fragments are selected to have as low sequence identity as possible to other human proteins. A number of 281 proteins were included, targeted by 367 antibodies, i.e., several proteins were detected by more than one antibody. Protein profiles were generated for the selected 367 antibodies using a suspension bead array methodology, as previously described . In brief, the 367 HPA antibodies were attached to color-coded magnetic beads, then incubated with 45 μl diluted and biotinylated EDTA-plasma, followed by an addition of streptavidin-conjugated R-phycoerythrin (Invitrogen), and finally analyzed using a FlexMap3D instrument (Luminex Corp.). A more detailed description can be found in Additional file 2. Univariate statistical testing, correlation analysis, and receiver operating characteristic (ROC) analysis were performed using R . Wilcoxon rank-sum test were used to single out potential biomarkers in the study with Bonferroni correction for multiple testing. The number of missing data points for each variable is shown in Additional file 3. Variables with an absolute value of Spearman’s correlation coefficient (rs) between 0.20 and 0.39 were reported as weak correlations and 0.40 and 0.59 was interpreted as moderate correlations, rs between 0.60 and 0.79 as strong correlations, and between 0.80 and 1.0 as very strong correlations. Sixty-six patients belonged to the aPL+ and 63 to the SSA/SSB+ SLE subgroup (Fig. 1). Only three patients (0.03%) were positive for both LA and SSA/SSB and not assigned to any of the two subgroups. Secondary Sjögren’s syndrome (sSS), diagnosed according to the American-European Consensus criteria , was present in 34 patients (54%) in the SSA/SSB+ subgroup. In the aPL+ subgroup, 28 patients (42%) were found to have secondary APS (sAPS) according to the Miyakis definition of APS . Several clinical and serological measurements differed between the two suggested main subgroups (Table 1). Nephritis was less common in the SSA/SSB+ group (21% vs. 48%). Disease activity as measured by SLEDAI-2K was higher in the aPL+ group while SLAM scores did not differ. SLICC scores were also slightly higher in the aPL+ subgroup, despite similar disease duration in both groups. In the SSA/SSB+ group, we observed higher levels of total IgG but lower levels of total IgM than in the aPL+ group. RF was increased in the SSA/SSB+ subgroup and the levels of RF-IgM differentiated the SSA/SSB+ subgroup from the aPL+ subgroup with a ROC AUC of 0.79 (Fig. 2). The number of leucocytes was lower in the SSA/SSB+ subgroup, a difference partly due to the increase of neutrophils in the aPL+ SLE subgroup. Biomarkers associated with systemic inflammation, i.e., fibrinogen, α-1 antitrypsin, and triglycerides, were increased in aPL+ SLE. Complement factor 2 (C2), i.e., a component of the classical pathway of complement activation, was higher (p < 0.0001) in the SSA/SSB+ as compared to the aPL+ subgroup. A trend towards higher levels of complement factors C1q, C3, and C4 was also observed in the SSA/SSB+ subgroup. In addition, we noted that a degradation fragment of complement factor 3 (C3dg), a measure of complement activation , was higher in the aPL+ group (p < 0.0001) suggesting more complement activation in the aPL+ than in the SSA/SSB+ subgroup. More patients in the aPL+ subgroup were treated with warfarin (n = 21 vs. n = 5) and selective serotonin reuptake inhibitors (SSRI) (n = 7 vs. n = 4). However, 68% of the patients in the aPL+ SLE subgroup were not on warfarin, and with respect to other medications, there were no significant differences between the two suggested subgroups (Additional file 4). The protein profiles obtained by affinity proteomics for the two SLE subgroups revealed significant differences in several proteins (Table 2). Integrin beta-1 (ITGB1, Fig. 3a), solute carrier family 13 member 3 (SLC13A3, Fig. 3b), and ceramide synthase 5 (CERS5, Fig. 3c) were the proteins with the lowest p values, and all three were elevated in the SSA/SSB+ subgroup. 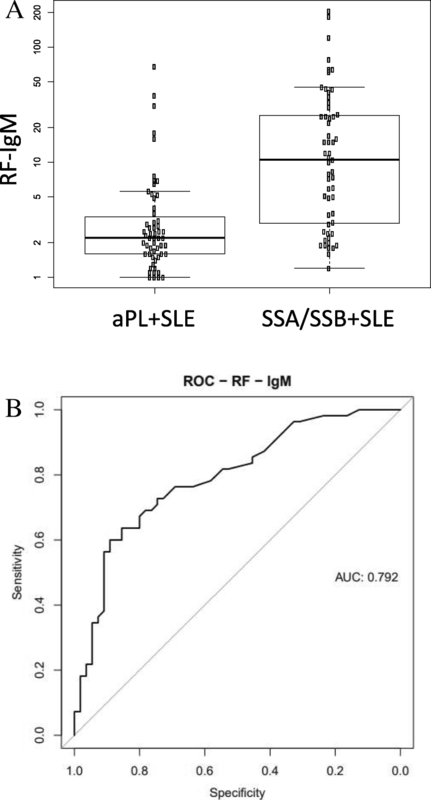 The best predictor for distinguishing between aPL+ SLE and SSA/SSB+ SLE in ROC analysis was ITGB1 (Fig. 3a), showing an AUC of 0.89 (Fig. 3d). The proteins reported in Table 2 did not correlate (rs < 0.2) with measures of disease activity. Among the 25 proteins with the lowest p values comparing the two subgroups (Table 2), three proteins were downregulated in the SSA/SSB+ subgroup, i.e., keratin, type II cytoskeletal 7 (KRT7), serum amyloid P-component (APCS or SAP), and protein CYR61 (CYR61). Seven of the 25 proteins showed weak positive or negative correlation to RF-IgM, ten correlated strongly (rs > 0.60), but none of the proteins showed very strong correlation to RF-IgM. The correlation between RF-IgM and all proteins analyzed (n = 281) is shown in Additional file 5, and rs for the 25 proteins is shown in Additional file 6. When studying the correlation between RF-IgM and the 25 proteins in data obtained for the controls, excluding data from SLE patients, five of these proteins were found not to correlate (rs < 0.2) to RF-IgM, i.e., keratin, type II cytoskeletal 7 (KRT7 or sarcolectin), glutamic-oxaloacetic transaminase 1 (GOT1 or aspartate aminotransferase, cysteine aminotransferase), ethanolamine phosphate phospholyase (ETNPPL or alanine--glyoxylate aminotransferase 2-like 1, AGXT2L1), renin (REN), and dimethylaniline monooxygenase 1 (FMO1). To shed light on the heterogeneity of SLE we built on previous observations [8, 9], we designed a simple and clinically useful subgroup definition based on autoantibody profiles. The SSA/SSB+ group was characterized by elevated levels of IgG and depressed levels of IgM, in line with a recent report from our group , and lower frequency of nephritis (21% vs. 48%). Others and we have previously noted that SSA/SSB antibodies are associated with a less severe SLE, with less renal manifestations and reduced risk for cardiovascular disease and mortality [7, 23, 24]. It is known that SSA/SSB autoantibodies in patients with SS are associated with RF  and we could confirm higher levels of RF of IgG, IgM, and IgA isotype in the SSA/SSB+ group. Signs of systemic inflammation were found to be increased in the aPL+ subgroup, which is in agreement with previous studies of primary and secondary APS [26, 27]. In the aPL+ group, indicators of complement activation (lower C2 and higher C3dg) were pronounced. These observations are in line with several previous reports. Oku et al. reported that hypocomplementemia is common in primary APS  and C3 and C4 levels have been reported to be decreased in APS . Furthermore, complement inhibition prevented aPL-induced pregnancy loss and thrombosis in mice , and eculizumab, an antibody that binds to complement factor 5 and blocks terminal complement activation, reversed catastrophic APS . Together these observations indicate that complement activation is a feature in APS as well as in the aPL+ SLE. Therefore, complement inhibition may be a more targeted approach of treatment for this subgroup of SLE patients. 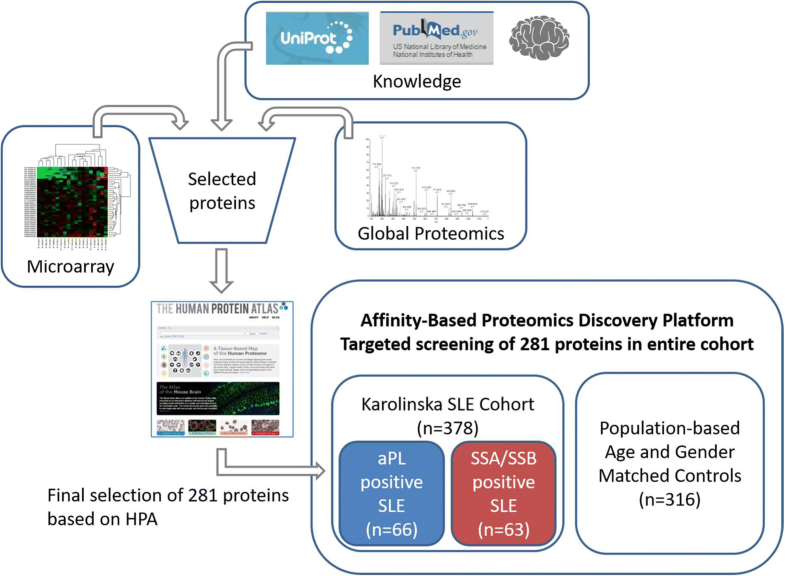 A large effort was put in the selection of proteins, which is crucial to obtain informative protein profiles by affinity-based proteomics . When applying affinity-based proteomics, 25 proteins could distinguish between the subgroups (p < 0.001). The protein with the best separation power (lowest p value) was integrin beta-1 (ITGB1), followed by solute carrier family 13 member 3 (SLC13A3) and ceramide synthase 5 (CERS5), and all three were elevated in the SSA/SSB+ group. ITGB1 (or CD29) is a protein that enhances autoreactive T cell activation and has been shown to be elevated in SLE patients with active disease . SLC13A3 is an ion transporting plasma membrane protein enriched in kidney. It has been reported as a genomic biomarker in mice with a progressive loss of kidney function, and the protein expression was increased in human biopsies from patients with severe chronic kidney disease, stage III/IV . The role of SLC13A3 in plasma vs tissue and its role in SLE merit further investigation. CERS5 is an enzyme involved in the sphingolipid metabolism. It catalyzes the formation of dihydroceramide and is known to suppress phosphatidylcholine biosynthesis . Ceramides are signaling molecules affecting the immune system  and are involved in endothelial dysfunction . In CERS5 knock-out mice, the cellular C16:0 sphingolipid pool is decreased , and in our previous work, we showed that C16:0 ceramide was elevated in SLE compared to controls, normalized after immunosuppressive treatment, and that it was associated with higher disease activity . Most of the proteins differentiating the two groups were increased in SSA/SSB+ SLE, and only three of these proteins were decreased compared to the aPL+ subgroup, i.e., serum amyloid P-component (APCS or SAP), insulin-like growth factor-binding protein 10 (CYR61), and keratin, type II cytoskeletal 7 (KRT7 or sarcolectin). APCS is an acute phase protein structurally related to C-reactive protein. It is involved in clearance of dead cells  and might be associated with atherothrombosis , a known feature associated with aPL in SLE . CYR61 is known to be increased in an inflammatory state of SLE , which is in line with our observation of increased systemic inflammation in aPL+ SLE patients. The third protein with decreased levels in SSA/SSB+ subgroup was KRT7, a protein that blocks interferon signaling . Primary SS is known to be associated with chronic type 1 IFN response [43–45]. The association between aPL and IFN signature is more debated, and there are just a few studies reporting an IFN signature in primary APS . We recently demonstrated that aPL+ SLE patients had lower levels of circulating INF-α as compared to other lupus patients . As mentioned, we detected lower levels of KRT7 in SSA/SSB+ SLE suggesting increased IFN signaling in this subgroup. In addition, we detected elevated levels of non-receptor tyrosine-protein kinase TYK2 (TYK2). TYK2 is known to initiate type I IFN signaling and is associated with the IFN-α receptor 1 . TYK2 has also been reported as a susceptibility gene in SLE . Increased levels of transcription factor ETV7 (ETV7, or ETS translocation variant 7, or TEL2) in SSA/SSB+ SLE further support a more pronounced IFN signature on the protein level in this subgroup compared to aPL+ subgroup. ETV7 is an IFN-α-stimulated gene , also known to induce IFN-γ . Furthermore, AT-rich interactive domain-containing protein 2 (ARID2 or BAF200), a subunit of the polybromo-associated barrier-to-autointegration factor (PBAF) chromatin-remodeling complex, which is known to regulate the expression of multiple interferon-responsive genes , was elevated in the SSA/SSB+ SLE subgroup. These findings support increased IFN signaling in the SSA/SSB+ subgroup and suggest that IFN-blocking therapy might be favorable in this subgroup. One limitation with our study, and a natural obstacle in many studies when comparing different groups of patients, is the difference in treatment between groups. For ethical reasons, it was not possible to withdraw treatment to perform this study. As expected, more patients were on warfarin in the aPL+ subgroup (31% vs. 8%). However, most of the aPL+ patients did not receive this medication. Another limitation might be secondary binding problems that are present in all immunoassays but is usually neglected and seldom discussed. RF could be an interfering factor in the affinity proteomics, and since it is more pronounced in the SSA/SSB+ subgroup, this might influence the results. RF may enhance the signal in the biotinylated sample if RF binds to the targeted protein, to the assay antibody directly, to the IgG in plasma that interact with the targeted protein, or to the assay antibody on the bead. However, this problem is rather unlikely since RF is an antibody binding to the Fc region of IgG  and we have applied sample dilution with appropriate buffers to limit secondary binding. For the majority of the proteins in Table 2, we observed a weak or moderate correlation to RF-IgM and three of these even showed negative correlations, i.e., RF-IgM did not enhance the signal for these proteins. We believe that the differences in protein profiles between the two subgroups reflect actual differences and that the correlation to RF-IgM is a biological phenomenon and not represent methodological artifacts. We suggest that the present SLE diagnosis harbors at least two main subgroups, here defined by autoantibody profile as aPL+ and SSA/SSB+. 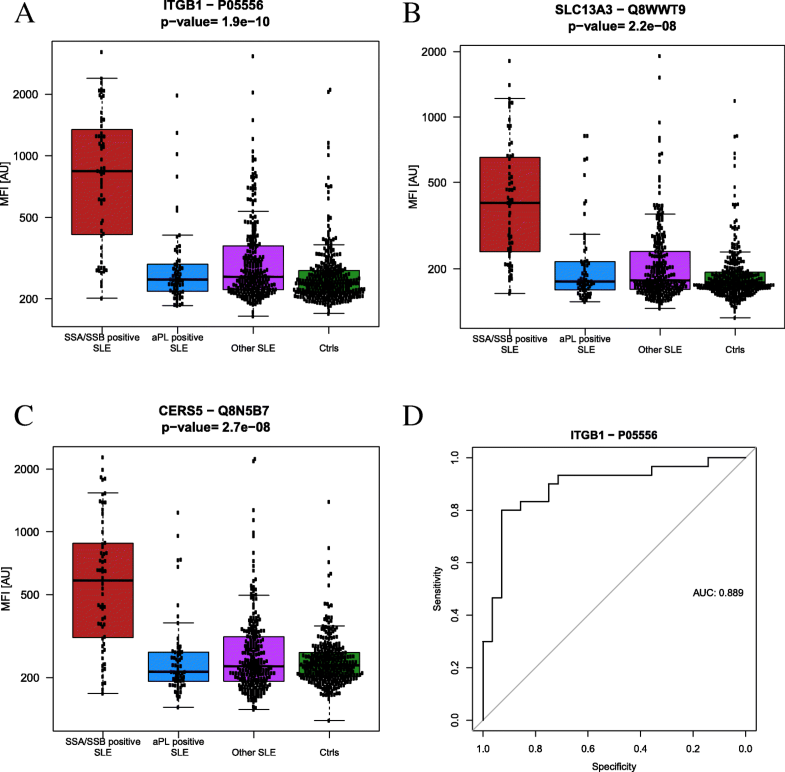 Several new candidate biomarkers were identified in this work highlighting differences in molecular signature between the two subgroups implying possible differences in pathogenesis and treatment perspectives. We suggest that IFN-directed therapy is more likely to be efficient in the SSA/SSB+ subgroup since this subgroup seems to have an activated interferon system. Complement activation and systemic inflammation were more common in the aPL+ group suggesting that therapy targeting complement is more effective in this subgroup. It is important to identify subgroups with increased risk of long-term co-morbidities, e.g., the increased risk of vascular events, and if such patients can be identified at an early stage and treated prophylactically, severe outcomes may be prevented. We would like to acknowledge Eva Jemseby, Ganna Oliynyk, Jenny Forshed and Rui Mamede Branca at Karolinska Institutet; Lillemor Stenbeck Funke at Uppsala University; Agneta Zickert, Ola Börjesson and Johanna T Gustafsson at Karolinska University Hospital; Cecilia Mattsson at KTH Royal Institute of Technology, all in Sweden. This study was supported by the AstraZeneca-Karolinska Institutet Joint Research Program in Translational Science. Funding was also received from The Swedish Research Council (grants no: 2017-02577, 2014-33867), VINNOVA, Swedish Heart-Lung Foundation, Stockholm County Council (ALF, grants no: 20160378, 20170038), Innovative Medicines Initiative (EU/EFPIA, ULTRA-DD grant no: 115766), The King Gustaf V 80th Birthday Fund, The Swedish Rheumatism Association (grants no: R-755861, R-73931), The Åke Wiberg Foundation, Alex and Eva Wallströms Foundation, Karolinska Institutet’s Foundations, and The Foundation in memory of Clas Groschinsky, The Swedish Society of Medicine, Ingegerd Johansson´s foundation, the Apotekare Hedbergs foundation and the Sigurd and Elsa Goljes minnesfond. Supplementary material are available. The datasets used during the current study are available from the corresponding author on reasonable request. ASa and HI carried out the MS-based proteomic experiments/data analysis and JL participated in the study design. AZ performed the affinity-based proteomic experiments/data analysis and PN conceived of the study and interpretation. LT and BN were responsible for the data on complement factors by conventional methods. KE were responsible for the autoantibody profiling in the cohort. ASo and JR were responsible for the RF measurements. GG and MK evaluated the sAPS and sSS data respectively. IG and ES were responsible for the clinical data and cohort design/collection. ES, PJ and HI conceived of the study and participated in its design and coordination. All authors drafted or revised the manuscript critically and approved the final version. The ethical board at the Karolinska University Hospital approved the study (reference number 03-556). All study participants gave written informed consent to participate. All coauthors have declared consent for publication. LT has consultancies for Euro Diagnostica (< $10,000), JM is employed by AstraZeneca, and JR is a member of the scientific advisory board for Phadia/Thermo Fisher. This study was supported by the AstraZeneca-Karolinska Institutet Joint Research Program in Translational Science. Other authors declare that they have no competing interests. Gustafsson JT, Gunnarsson I, Kallberg H, Pettersson S, Zickert A, Vikerfors A, Moller S, Ronnelid J, Elvin K, Svenungsson E. Cigarette smoking, antiphospholipid antibodies and vascular events in systemic lupus erythematosus. Ann Rheum Dis. 2015;74(8):1537-43. https://doi.org/10.1136/annrheumdis-2013-205159.